Love these gorgeous Penny Black girls and this one is no exception. Can you tell that I had a blast colouring this little scene…. and you may have noticed that I’m obviously back on my orange/pink kick again. Thanks for your visit today, I’m back on Friday with another video to share! Other Supplies: Inktense Pencils – Baked Earth, Iron Blue, Oak, Ink Black, Sicilian Yellow, Beech Green, Neutral Grey, Chilli Red, Carmine Pink, Sienna Gold, Shiraz, Saddle Brown, Willow, Sienna Gold, Amber, Mustard, Red Oxide, Sepia Ink, Deep Indigo. Watercolour cardstock. Tiny orange Rhinestones from Queen & Co.
< Previous Video : A Fishy Wedding? Next > Video : Like Gnome One Else! Very pretty card Therese, I can see why you go with the pink and orange combo as it really works perfectly doesnt it. WOW!!! LOVE your card and love the color combo! would love to see you color this one.. I ordered the stamp right away..so you sold it to me…LOVE it! I adore this stamp set, Therese, and love what you’ve done with it! Great card, my friend! YEs, I can tell … and I’m so happy about it! Just gorgeous, Therese! This Mademoiselle may have just visited the same patisserie where I found my macarons! 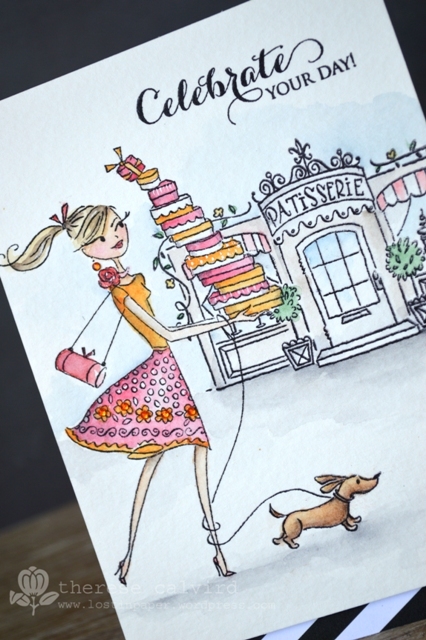 Gorgeous card, love the colours and hope she gets the cake to its destination. I’m sure you had a blast colouring this! Love it! And P.s. you are really an angel! Thank you! You know what I mean. Such a lovely scene and I love your coloring, Therese! 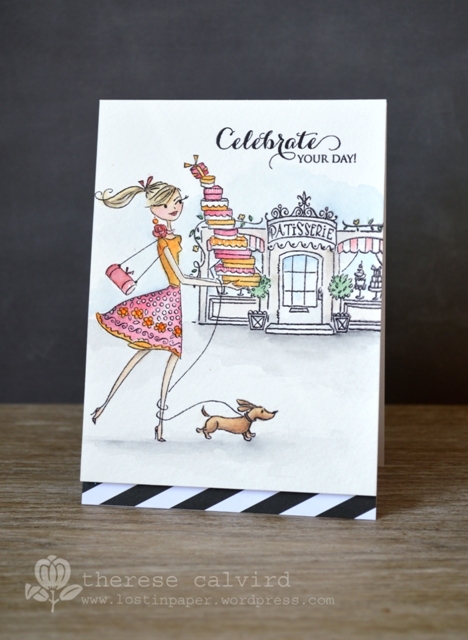 Love the diagonal striped border, too…such a beautiful card! Love the pink and orange – it is so happy! Great scene you created – very ooh la la! i love this.. PB stamps are so fun.. you rocked it.. AWESOME! love this! I am trying to do shadows and I am always too heavy handed. Love this stamp set. I love these stamps so much but they wouldn’t do any good in my stash and I wouldn’t be able to bring them to life like you do. So beautiful! Very chic indeed! Oh to have a figure like that!